Snow on beans at the April Hemmes farm. Some farmers in northern Iowa are finally getting back into their fields this week. Monday’s U.S.D.A. crop report showed Iowa’s soybean harvest at 19%, which is 11 days behind the average. The harvest was halted this month by heavy rains that turned fields into a muddy mess. 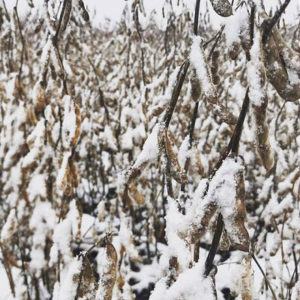 Hemmes said her soybeans were coated with two inches heavy, wet snow on Sunday. It’s the wettest year she’s experienced in 33 years of farming and Hemmes said there’s some pod-splitting taking place. “I don’t see the sprouted pods, like a lot of the guys I talk to in southern Iowa. But we’re going to have to get in there pretty quick, because the stalk quality is really going downhill,” Hemmes said. According to the U.S.D.A, the 19-percent soybean harvest is the smallest mid-October harvest percentage for Iowa since records began, and the lowest number among the major soybean producing states. Hemmes said, earlier this year, she was excited about her potential soybean yield. “I was looking at one of my best bean crops ever and I’m just watching it…not being able to get out there to it now. Hopefully those yields are still there,” Hemmes said.